As the story goes, in 490BC Pheidippides was dispatched from Athens to Sparta to ask for help against the invading Persian forces. 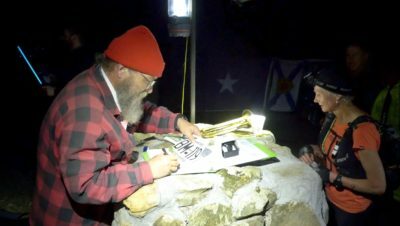 According to legend, he covered the 150 mile distance and arrived the next day. Now most people would be glad to enjoy that story and marvel at this incredible athletic feat. But in 1982 RAF officers John Foden, John Scholtens and John McCarthy decided to see whether they could repeat the journey within the same time limit as part of a military expedition. 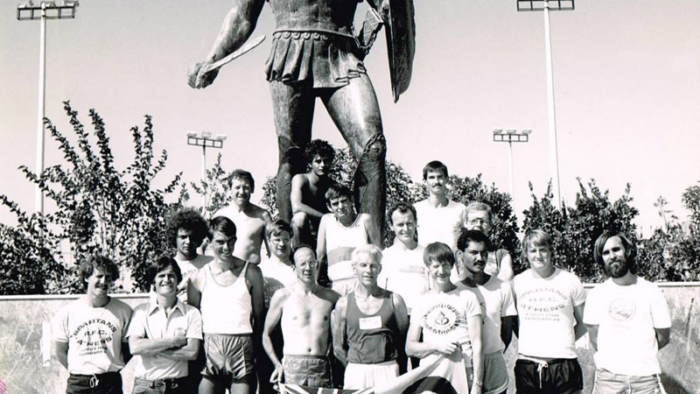 They did and this led to the first Open International Spartathlon Race the following year. A race of 153 miles (to be precise) is obviously incredibly hard in itself, but there are other factors which make this race the stuff of modern day legend, as well as ancient Greek folklore. Let’s take a look at why this race is so revered. Firstly, it takes place mainly on the hot, dusty, and often busy roads of Greece in temperatures which range from the 30s down to 4 degrees centigrade at night. Running in the heat on the road is tough and the runners will be exposed to the elements with nowhere to hide. Secondly, there are strict cut-offs all the way along the race and they aren’t easy! The cut-off for the first marathon is 4 hours and 45 minutes, which sounds ok, but that’s the first marathon of six! 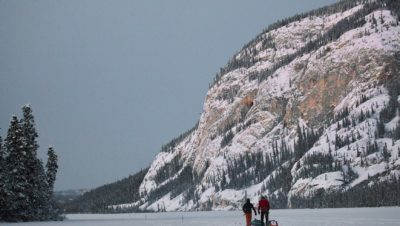 The cut-off at 50 miles is 9 hours, 30 minutes. That means that you need to average 11 minute miles to reach it, no easy task when you factor in the heat and stops for food and drink. There are 75 checkpoints throughout the race, so you can’t really afford to have a bad patch. The ultimate cut-off is 36 hours, so you are allowed to slow down a little along the route but that still equates to 13 minutes per mile. So this isn’t one of those ultras where you can afford to walk much. In fact, runners have to qualify to be able to enter it by running 100k in less than 10 hours for men and 10 hours 30 minutes for women. Alternatively you can run 200k in 29/30 hours. Thirdly, you know how we said that the race is ‘mainly’ run on the road? Well it does include one 1200m mountain to ascend at around the 100 mile mark. Just because it needs an extra factor to make it a bit harder. That cut-off is looking slightly harder now isn’t it? So you’ve got the heat, a mountain, a huge distance by anybody’s standards, and you have to maintain a decent pace. As you might expect, completion rates for the race aren’t high with around 40 – 50% of runners finishing. However, we know how tough British ultra runners are and they are very successful in this race! We’ve had winners, including Lizzy Hawker, who won in 2012 (and came third overall), James Zarei (1994 and 1995), Emily Gelder (2010) and Hilary Walker (1987 and 1992). Dan Lawson came second in 2015, Heather Foundling-Hawker second in 2010 and Mimi Anderson third (and was first Brit) in 2011. 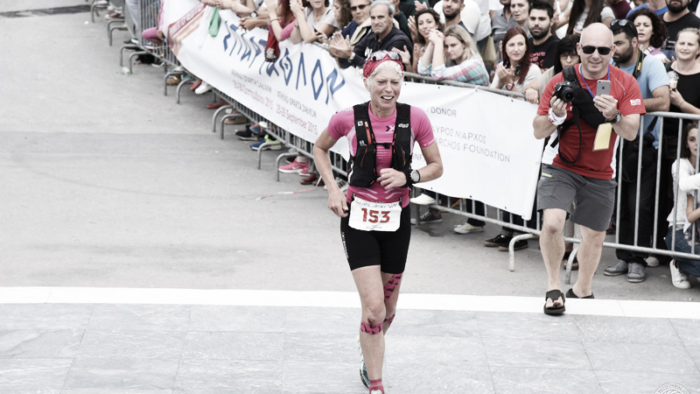 Mimi also famously completed the double Spartathlon in 2015, running from Athens to Sparta, then returning to Athens. 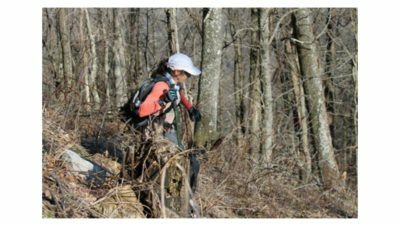 This race attracts some of the best ultra runners from all over the world. Scott Jurek won it for three years in a row (2006 – 2008) and the men’s record is held by the legendary Yiannis Kouros (20 hours, 25 minutes). 390 runners will take part in the race this year on September 28/29 and 25 of them will be British. The British team will be captained by Paul Ali and the team includes Welsh international Nathan Flear (pictured in the header image), Ian Thomas who won this year’s Essex 100 Mile race, and Cat Simpson, first female in the 2017 145-mile Grand Union Canal Race. 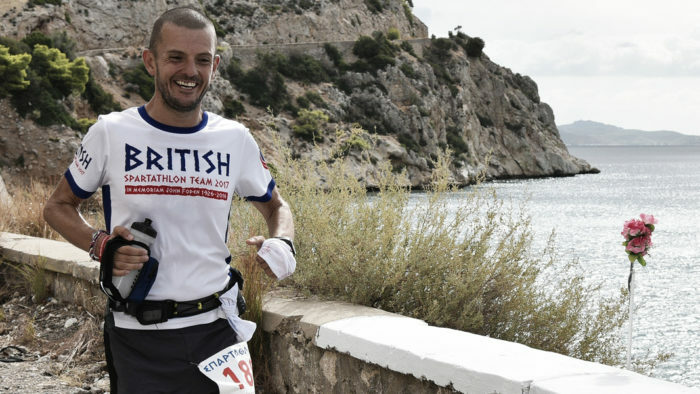 We’d like to wish all of the British Spartathlon team the best of luck. You can see who is in the team here. You can find all of the information on the race here and there will be live tracking on there.